The Stalker PATROL - Police traffic radar. prior to installation. Failure to do so voids the product warranty and we disclaim any liability for any damage, loss, or injury resulting from the failure to use an authorized cable. The police traffic radar Law Enforcement has been waiting for. The Stalker engineers have developed the K-Band digital antenna specifically for the Stalker PATROL. This waterproof antennas utilize the same digital technology and shielding as our Ka-Band antennas, plus the innovative use of USB connectors for computer-proven high-speed data communications. In the process, the antennas remain small and attractive - and one of the smallest K-Band horn type assembly antennas on the market. The Stalker PATROL achieves superior range and noise immunity by digitizing the Doppler audio signal at the antenna and using a high-speed digital communication link to transmit data between the antenna and the counting unit. Traditional two-piece radar units send a low-level Doppler audio signal from the antenna to the counting unit for processing and speed display. This method is susceptible to noise induced by the auto ignition, radio towers, and 2-way radio transmissions, which results in reduced range and increased potential for false targets. improved the range of our products. The Stalker PATROL uses O-ring sealed, K-Band antennas. These compact, completely waterproof antennas include locking connectors and can be exterior mounted with no environmental concerns. The Stalker PATROL utilizes Liquid Crystal Display (LCD) technology. The LCD readout provides an excellent contrast ratio in bright sunlight, with a dimmable backlight feature for easy nighttime viewing. Other LCDs have a fixed backlight while the Stalker PATROL allows the operator to select various levels of lighting to best fit the ambient light conditions. Prior generation LCD technology also had a limited viewing angle, and once that angle was exceeded, the display became difficult to read. The viewing angle of the Stalker PATROL has been enhanced to allow the counting unit to be mounted in various positions within the patrol vehicle without loss of readability. Connecting the radar to power and VSS has never been simpler. Plug the Stalker CAN/VSS cable into the car's OBD II diagnostic port located under the dash on the driver's side, and you're done. No cables to splice, no wire harnesses to locate, just simple plug-n-play. The Stalker PATROL utilizes high-speed USB cables and connectors, another Stalker first. The USB technology, proven in the computer industry, provides low noise, high speed communications and data flow. 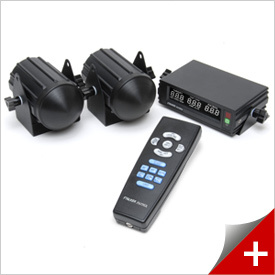 Additionally, the antenna connections are waterproof, the entire assembly fast and secure. As with all Stalker innovations, USB technology assures a long life of product performance and reliability. 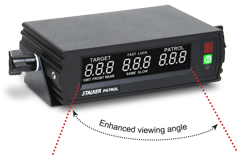 Stalker's patented Faster Speed Tracking assists the operator in making proper target identification by displaying both the Strongest and highest-speed targets simultaneously on separate, high- readability display windows. 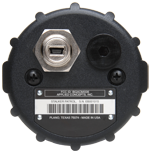 The serial RS-232 port can interface with most video cameras, computers, remote readouts, printers, etc. The Stalker PATROL compensates for patrol speed variations when generating the Doppler audio. Since the audio tones do not vary with patrol speed, the operator learns to correlate this true Doppler audio with target speed, which eliminates the need to constantly watch the display to determine target speed. Display: Sunlight viewable WHITE on BLACK Liquid Crystal Display (LCD) panel with seven icons and triple 3-digit windows for target, lock/fast and patrol windows. LCD has HEA film and 9 o'clock orientation.